Eleven survivors were hospitalised with burns after the accident in Siberia. A PASSENGER PLANE has crashed in Siberia shortly after taking off, killing 32 of the 43 people on board, Russian emergency officials said. The 11 survivors were hospitalised in serious condition after this morning’s accident. The ATR-72, a French-Italian-made twin-engine turboprop, operated by UTair was flying from Tyumen to the oil town of Surgut with 39 passengers and four crew. Xinhua reports that the plane disappeared from air traffic controllers’ radar after take-off, and lost communications contact. It burst into flames on the ground, with survivors reported to have suffered burns. 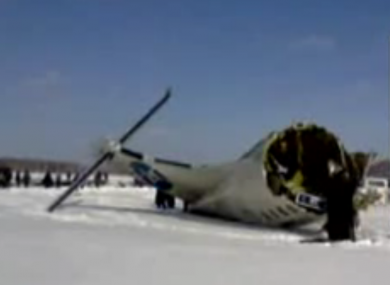 The aircraft went down on a snowy field outside Tyumen, a major regional center in Siberia. The cause of the crash was not yet clear. UTair published a list of the passengers and crew, and none of them appeared to be foreigners. The Emergency Situations Ministry said 12 survivors were flown to a hospital by helicopter, but one of them died there. Russia has seen a string of deadly crashes in recent years. Some have been blamed on the use of aging Soviet-era aircraft, but industry experts point to a number of other problems, including poor crew training, crumbling airports, lax government controls and widespread neglect of safety in the pursuit of profits. Email “32 killed as passenger flight crashes after take-off”. Feedback on “32 killed as passenger flight crashes after take-off”.